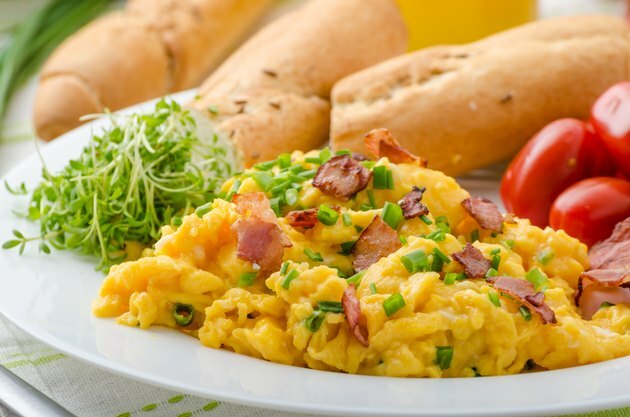 Cooking eggs for the next day saves you time in the morning and while still providing home-cooked breakfast. Pre-cooked eggs also work as a healthy lunch option, especially if you do not have access to a way to heat up your lunch. How you prepare them for the next day depends on whether you want to reheat them or eat them cold. Reheating eggs can be challenging, because if you overheat them, they will become dry and rubbery. Break the eggs into a bowl and whisk them with a wire whisk or a stick blender. When you cook eggs outside of the shell, whipped eggs reheat better than whole eggs. Add milk to the egg mixture to keep the eggs moist when you reheat them. Use 1 tbsp. of milk for each egg. Scramble the eggs in a skillet over medium heat until they are fluffy but still slightly underdone for your taste. Undercooking them leaves some moisture in the eggs and keeps them from drying out in the refrigerator or while reheating. Mix the eggs with sautéed vegetables or cooked meats. Pour the mixture into a baking dish and bake the eggs at 350 degrees until the edges firm up but the center is slightly soft. Use this method if you prefer quiche-like eggs instead of scrambled. As with the scrambled eggs, you want them a little under-done so that you can finish them the following morning. Boil the eggs in a pot until they are to your desired level of doneness if you prefer not to whip them. Boil them for up to up to 5 minutes for a soft-boiled egg and up to 15 minutes for a hard-boiled egg. The longer you boil the eggs, the firmer they become. Break the eggs into a bowl and whisk them with a wire whisk or a stick blender. Add 1 tbsp. of milk, if desired. Scramble the eggs in a skillet over medium heat until they are done to your taste. You can also cook the eggs into an omelet or an egg bake, but they must be cooked to doneness because you will not be adding any more heat. Boil whole eggs in a pot as an alternative to whipping. Cook them to your desired level of doneness: up to 5 minutes for a soft-boiled egg and up to 15 minutes for a hard-boiled egg. Put the eggs in an airtight container and transfer them to the refrigerator immediately after cooking. Leaving eggs out too long could lead to food-borne illnesses. Leave the boiled eggs in the shell and put them in an air-tight container to prevent the odor from permeating your refrigerator. You can eat boiled eggs cold the next day or reheat them by putting the eggs, in the shell, in a heat-safe container, pouring hot water over them and letting them sit for 10 minutes. Do not reheat boiled eggs in the microwave. Reheat the whipped eggs in a covered dish in the microwave for the best results. Set the microwave to high and heat in 60-second increments. You can also eat cold fried eggs, but you should cook them until the yolks are firm. Do not try to reheat fried eggs; they will get rubbery no matter how long you cook them.